With “Penny” Hardaway we start the final countdown of the top ten point guards of the 90s. 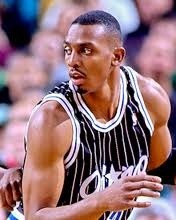 Hardaway was and still is, one of my favourite players. He was considered by many, as the next “Magic” Johnson, then Michael Jordan picked him as his successor but fate had other plans for him. I could pick him, easily, in the top ten of the unluckiest players of all-time. Even if he never reached his full potential, even if he never won a championship, he was one of the most impressive and talented players to watch. There is a list of active well-known NBA players, including Lebron James, Tracy Mcgrady, Gilbert Arenas, Joe Johnson and Tyreke Evans, that idolized Hardaway. Penny was not the usual type of point guard, in fact I loved it when he shifted to the shooting guard position as he was a superb scorer. Even though the consecutive injuries have crippled him and never showed what he was able of, I consider myself lucky that at least I had the opportunity to watch the show that he gave at the 1996-97 season play-offs against the Miami Heat, where even though his team lost (3-2) to a much better Miami team he averaged 31.0 ppg., 6.0 rpg., 3.4 apg., 2.4 spg. and 1.4 bpg. in 5 games starting as a shooting guard and almost won the series for Magic by himself. At the beginning of his NBA career, fate was not that bad to him; he was drafted by the Golden State Warriors at number 3 of 1993 NBA Draft and he was immediately traded to Orlando for the number 1 draft pick Chris Webber. This trade brought Hardaway to play alongside another promising youngster, that has made his debut a year before, known by the name Shaquille O’Neal. The combination of these two turn almost instantly the Orlando Magic from just an expansion team to a force to be reckoned with, in the Eastern Conference. Penny Hardaway was too tall for a point guard, 6-7, but he was a really smart player with mad skills that made him able to play both guard positions and even some small forward exceptionally well. He played in four consecutive all-star games (three of them as a starter) from 1994 to 1998 for the Eastern Conference and he was named a “Dream-teamer” as he was chosen to play for the US Olympic basketball team at 1996 alongside the elite of NBA stars of that era. He has also been voted for the all-NBA first team, two times (1994-95, 1995-96), one time for the all-NBA third team (1996-97) and he was a member of the all-rookie team in 1993-94 season. He played only for the Orlando Magic during the 90s and then he was traded to the Phoenix Suns, later to the New York Knicks and finished his career as a player of the Miami Heat. As a member of the Orlando Magic team he played at the NBA Finals against the Houston Rockets in 1994-95 season, where his team lost 4-0 to the Rockets team but a remarkable moment in Magic’s way to the finals was the elimination of the Chicago Bulls at the second round of the Eastern Conference Play-offs (Michael Jordan had returned from his first retirement almost 20 games before the play-offs). The downfall of Penny Hardaway started during 1996-97 season, when he started having injury problems that proved later impossible to overcome. 1997-98 season was the beginning of the end of what would have been a great career, as a devastating knee injury left Hardaway out for the largest part of the season and he never became his old self after that injury. I feel blessed that I had the opportunity to watch this player in his prime and I would love to watch him play even now if he decides to return to the game of basketball but it is really a shame because if he didn’t get hurt I am sure that he would be one of the best players of all-time and probably the best shooting guard of the league other than Michael Jordan (Bryant has got nothing on the healthy Hardaway).